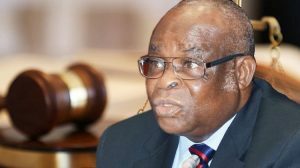 On the resignation of suspended CJN, Walter Onnoghen, Mba Ukweni said, “Onnoghen was serving Nigerians, even though at the helms of affairs of Judiciary but it was a service to the entire country, so I don’t see his resignation or voluntary retirement as anything wrong. “If the situation has reached this level where there is no more trust, the best option for him was to resign; I don’t see anything wrong with that. Onnoghen’s resignation was appropriate. “I don’t see it to be inappropriate, I think it is appropriate because what is he doing now, since this problem started, he has not been performing his duty as the Chief Justice of Nigeria. On whether it was too late for the erstwhile CJN to have thrown in the towel, Ukweni pointed out that it was not too late for him to resign, stressing that, “while I don’t see it as being late is because, in actual fact, it is the National Judiciary Council (NJC) that has the power to investigate him, not the Code pf Conduct Bureau. “That is the position most of us have been maintaining, we are not saying that he is above the law but if there is a procedure that had been laid down, follow it, it cannot, be because the President is interested in one way or the other that you discard the procedure that are laid down by law for proper implementation. “It shouldn’t be so, I don’t agree with that kind of thing because there are certain politicians including the President that do not want him to be there, then people feel that due process should be discarded. “Government itself should observed due process, God’s nature follow due process, so if there is no due process, even our own live can’t function properly, it is my believe that what he did is not belated and nothing wrong in turning in his resignation at this stage when he might have seen certain things unfolded.